FESCO Transportation Group, a leading Russian container logistics company, has completed the delivery of 5 tunnel-boring machines from Shanghai to Moscow via the Northern Sea Route, informs the company’s press service. The equipment was produced by China Railway Construction Corporation Limited and will be used to construct stations of a new line of Moscow metro. The project cargo was delivered in two lots. The first one consisting of 3 tunnel-boring machines had a total volume of 6,723 m3 and a weight of 1,870 tons. It was shipped from Shanghai at the end of July, 2017. Having passed 8,900 nautical miles along the Northern Sea Route, the vessel with the equipment arrived in early September at Bronka Port, the new deep-water port near St. Petersburg. 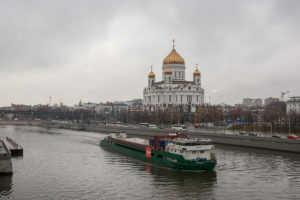 The cargo was discharged at the port, wherefrom it was delivered to Moscow in two different modes. One part with a total weight of 954 tons was shipped by barge to Moscow Yuzhniy river port and from there by truck to the client’s warehouse. And the remaining part was delivered from Bronka to Moscow warehouse directly by truck. The delivery of the second lot containing 2 machines of total volume 4,479 m3 and weight 1,225 tons, which was arranged in a similar way, will be completed by the end of November. The average time of transportation from Shanghai to Moscow was 3 months which was in accordance with the contract and with the availability of sites for unloading, informs FESCO. Within this project work, FESCO provided the full range of transportation and logistics services, including development of the unique intermodal delivery scheme, as well as customs clearance and carriage by various modes of transport. The Northern Sea Route has been extensively developing, attracting new carriers and cargoes. Thus, a total of 7.926 mln tons was transported by this route in 10 months of 2017, which is 8.3% more than the volume of the whole year 2016 (7.266 mln tons). Carriers start investigating the NSR as an alternative for the traditional ocean route from Asia to Europe. Thus, in August COSCO’s dry cargo carrier LIAN HUA SONG left the port of Lianyungang, sailed along the Russian coast by the NSR, then round the Northern Europe and having passed the Baltic Sea arrived at Bronka port. Maersk was reported recently to negotiate a trial voyage of a 3,000 TEU containership in the summer navigation period of 2018.